I had a lot of fun sharing what is currently on my shopping, oh won't you be mine list - some already are! (I've purchased 1 for my Feet/Flats, one for my Top/Blazer, and 1 for my Bottom/Slacks!) And I couldn't help myself by doing just one more. And these shoes... what.is.not.to.love!!!! Palest of pinks, little studs. I need the spare $$$ for these!!! A girl can dream right?! What would you add to your closet in your dreams????? Do SHARE! 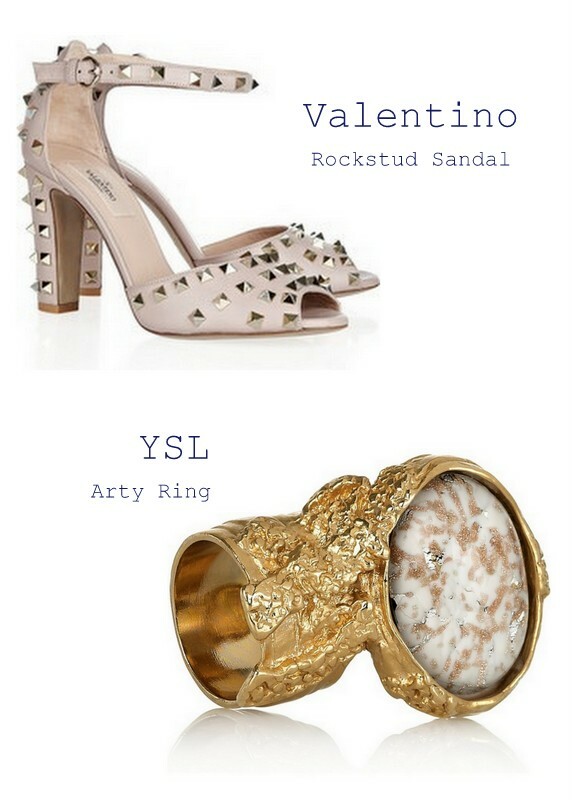 I'd be happy with any of the studded Valentino shoes, any! The shoes are just amazing! I was going to purchase an arty ring before but I could never decide on a colour! I have wanted that ring forever. ha, i have wanted that ring forever too. my hands just feel so bare without it! i'm currently stuck on the black stone with gold flecks...it's amazing. That ring is just SO chic and fabulous!